Background. In 2009, members of the Germantown Monthly Meeting and other community members founded a community garden on the site of the former tennis courts of Germantown Friends School in the 5400 block of Wissahickon Avenue, adjacent to Cloverly Park. In 2015 the garden was closed so that GFS could sell the property. 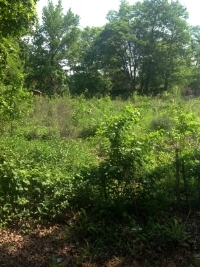 With a goal of acquiring, preserving, and rehabilitating a 0.65-acre parcel of the property at 5407 Wissahickon Avenue, the Old Tennis Court Farm Protection Project was formed and partnered with Natural Lands Trust and Neighborhood Gardens Trust to effect the purchase of the parcel and return it to use as a community garden. Germantown United CDC is serving as fiscal sponsor for community-based fundraising. The effort received widespread encouragement and support not only from the garden’s immediate neighbors, but also from members of Philadelphia’s City Council, the Senate and House of the Commonwealth of Pennsylvania, the Secretary of Agriculture of the Commonwealth of Pennsylvania, the Philadelphia Department of Parks & Recreation, the City Commissioner and City Planning Commission, Germantown United CDC, and multiple community organizations and neighborhood associations. What’s been done? Through grants and donations, the project raised the full purchase price and related costs by the deadline of October 31, 2016. Natural Lands received a grant of $225,000 toward the purchase from the Pennsylvania Department of Community and Economic Resources Greenways, Trails and Recreation program; and the project has raised $57,000 in contributions from the community. So that the garden could reactivate operations during the lengthy sale/purchase process, in May 2017, Neighborhood Gardens Trust entered a license agreement with GFS and the garden reopened as a formal affiliate of Neighborhood Gardens Trust. On May 18, 2018, our partner Natural Lands purchased the property on behalf of the community. Over the coming months, the title will be transferred to Neighborhood Gardens Trust as part of its inventories of community gardens across the city. © Friends of Cloverly Park. All rights reserved.